This is the 2nd time I have ordered this item. I ended up giving away the 2 I ordered the first time to family members. 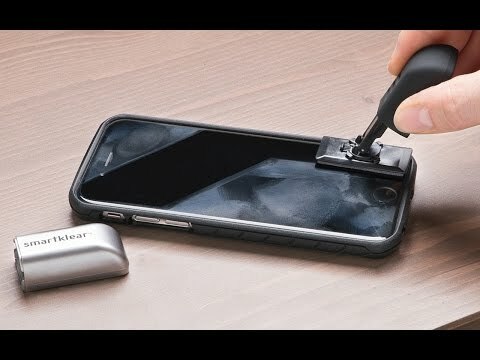 This is a simple way to keep your smartphones smudeg-free, and it works GREAT!!! It does exactly what you expect it to do. It easily comes out and cleans your device screen beautifully and then pops back into it's little top. It's perfect to fit in a desk drawer or purse does a no-streak job. Love it. 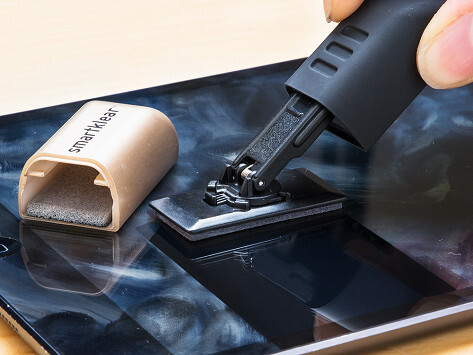 This does a great job of cleaning off smudges and dust (much better than the little roller I also bought from The Grommet). I was tempted by the one with a refillable liquid - as this does not get off "spatters" - but a little distilled water does the trick. Worked great on our cellphones and iPads. Cleans efficiently with just a few swipes task completed. At first, I bought just 1 to try it out. I loved it, worked great. I let my partner try it and my daughter. Soon, I could not find mine. Between them, it was always gone. So I ordered more. We have them all over now, wherever we use our phones, ipads, tablets, etc. We gave them as holiday presents as well and our friends loved them. What a great idea! I hope they are always available.